From an exhibition on Jane Jacobs at the Municipal Arts Society in New York City, 2008. 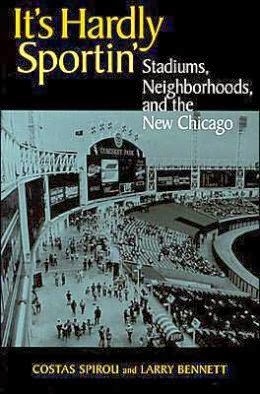 I am reading, finally, It's Hardly Sportin': Stadiums, Neighborhoods, and the New Chicago, a book published in 2003 that analyzes three separate sports construction endeavors in Chicago--building a new Comiskey Park, adding lighting to Wrigley Field, the home of the Chicago Cubs, and the creation of the United Center for basketball and hockey. Frankly, it's time for a second edition to include the rebuilding of Soldiers Field (which resulted in the building losing its designation as a historic landmark, because the changes were so marked), and the project underway to build an arena for DePaul University, a college basketball power, in Downtown Chicago ("Critics Say Chicago Shouldn't Aid DePaul Arena With Schools Closing" New York Times--although closing schools because of declining enrollments is unrelated). It would be interesting to include as a contrast a couple chapters on the creation of Millennium Park, technically unrelated. 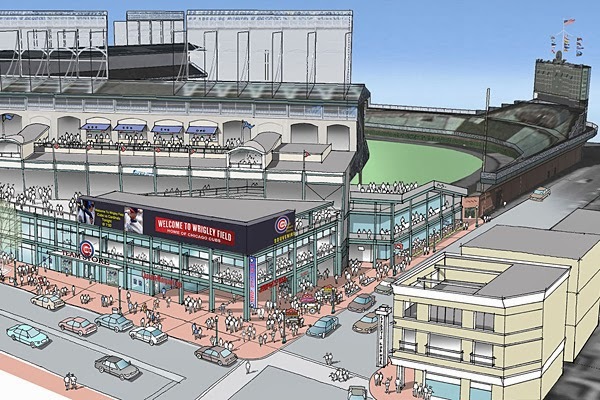 Plus, to increase their revenues the new owners of the Cubs are seeking changes to the stadium and new development opportunities around the stadium now, which is just as controversial as the previous process. DC and a soccer stadium. This comes up again because a recent Washington Post survey finds that DC residents don't favor providing subsidies to creating a new soccer stadium ("Six in 10 oppose Gray's plan for DC United stadium") and a commentator in the sports section ("Thoughts on D.C. United stadium poll") argues that the benefits of the stadium need to be better marketed and explained to residents so that we'll be supportive. This rendering by Gensler of a soccer stadium shows a walkway between the Navy Yard Metro Station and the Washington Nationals Baseball Stadium (pictured at upper right). 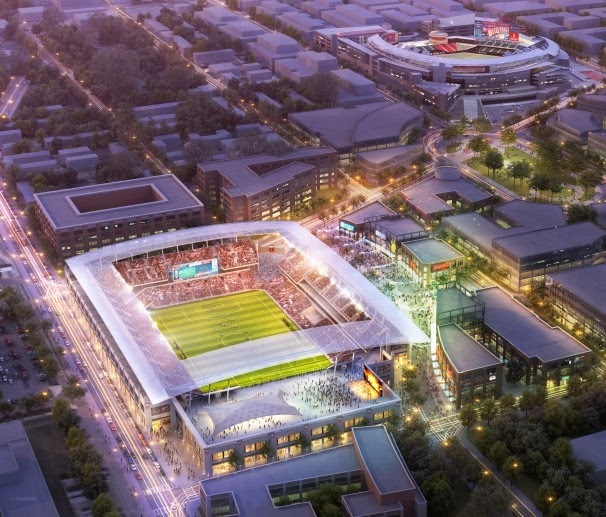 The specifics of the deal call for the District and D.C. United to split the estimated $300 million stadium cost, which includes land acquisition, remediation and construction of the 20,000-seat facility, located in the general area of 2nd and T streets SW.
A term sheet signed on the day of the deal's announcement requires D.C. to contribute roughly $140 million to the project, including $100 million for property acquisition and $40 million (capped at $50 million) for environmental remediation, demolition and infrastructure work. D.C. United will finance the stadium construction and hold a 30-year ground lease on the site. Rent: $1 a year. The book provides a thorough introduction to how postindustrial cities are now entertainment focused, and summarizes the general research on the economic impact of such facilities and teams. Frankly, every involved citizen who weighs in on such issues without being familiar with these arguments is at a disadvantage. It's especially useful in how it discusses the negotiations between the team and the City of Chicago (with involvement from the State), the role of the City Council, how teams play cities against each other by threatening to leave, the involvement of citizens groups and their ability to impact the process for each of the three projects, and the role of the media--the city's leading media company, which owned the Chicago Tribune and WGN-TV, also at the time owned the Chicago Cubs and Wrigley Stadium--in shaping the process. Every city needs a book like this that covers the big projects (so-called "public-private partnerships") as a kind of cataract surgery and reality check to the willful blindness and whitewashing of the history and back story about how these projects truly come about. A new DC football stadium too? Meanwhile some "insane" City Councilmembers want to build a new stadium complex to bring the Washington Redskins football team back to the city ("The 5 Strangest Parts of Vincent Orange's RFK Stadium Plan," Washington City Paper). Of all types of sports teams, football has the least economic return to localities because of the paucity of events and the expense of the stadium (e.g., "Super Bowl has NYC restaurant scene ready to score," Associated Press versus "Local Businesses See Scant Benefit From the Game That Can't Be Named," New York Times). Questions that should be answered for all stadium-arena proposals. The benefits question is tricky because as I wrote over the weekend ("Stadiums and arenas as the enabling infrastructure for "money-making" platforms") increasingly the financial benefits flow to teams at the expense of all other entities--localities and independent businesses--and financial engineering for tax and profit reporting purposes makes it difficult for localities to monetize the value of the team in tax revenues. (2) how much is returned in revenues to the locality from rents, taxes, parking revenues, etc. Increasingly, sports teams make agreements that seek to control as much as 100% of the spending and revenues that are derived from attending sports events. Note that these studies when performed by a team and/or a city economic development agency tend to be biased. (3) DC makes less revenue compared to other jurisdictions because because it is not allowed to assess income taxes on players who don't live in the jurisdiction--most cities/states tax visiting players on their game day equivalent earnings. DC only gets income taxes from players and staff who actually live in the city. I wish that leagues would "voluntarily" waive this provision. (4) who is spending the money that is spent and is the spending new to the locality? -- economic studies on sports events spending find that at the Metropolitan scale, it is merely one element of overall spending on entertainment and money spent on sports-events tends to displace money spent on other entertainment. On the other hand, if the attendees are mostly nonresidents, the locality does benefit somewhat as a receiver of financial flows that vis-a-vis the rest of the metropolitan area. (5) where are they spending the money? -- this is the key question because as pointed out the other day, sports teams are working to capture as much of the total spending on the event as is possible, to reduce spending at establishments not owned or franchised by the team directly. (6) what are the effects on the neighborhood and its commercial district -- does it change, does it improve, who does it serve? Just like there is debate about streetcars as economic development or transit or both ("STREETCARS ARE ABOUT TRANSIT, just in a different ...") the same goes for sports teams and stadium and arena projects. Teams capture an increasing share of the financial benefits from new stadiums, reducing spillover benefits. It's complicated more by determining who benefits. More and more, the team owners are working to control real estate development around the site, reducing the benefit to other potential actors. This is the case with the proposed Farmers Field in Los Angeles, and has been the experience with Staples Center there ("AEG non-sale is bad news for Farmers Field and NFL in L.A.," Los Angeles Times), and is said to be an issue with the proposed Tottenham project in London ("Tottenham's new stadium: how club can cash in on development plan," Guardian) which will result in reduced community benefits paid for by the team, and greater profits, and homes demolished to make way for an enhanced walkway to the stadium. I was surprised to see recently that in the United Kingdom, neighborhoods where soccer teams in the top league are located have higher property values than comparable areas without stadiums ("House prices hit fever pitch at Premiership football grounds," Times of London). And the discussion of the Lake View neighborhood in It's Hardly Sportin'-- "Wrigleyville" -- describes how even though residents closest to the stadium don't like its impact, the neighborhood has experienced in-migration and new residential construction (often by tearing down single family houses and replacing them with 4 to 6 story condo building flats, probably because of how it is branded and the commercial district closest to the stadium has become an in-region nightlife destination, which continually introduces new audiences to the neighborhood. Verizon Center example. This is tricky too. For years I've argued that the Verizon Center wasn't the cause of the revival of the east end of Downtown DC and it wasn't. BUT there is no question that it contributed positively. I have to admit that at the time that the Center was proposed, DC was in the midst of financial turmoil and trends favoring urban living weren't so evident, and it hadn't been too long before that DC's murder rate spiked, so it was in fact a signature development that communicated to other developers and potential investors that DC was worth investing in. Plus, Verizon Center helps to anchor residential development in the greater area, and as an additional benefit, the Georgetown University basketball team plays its games at the Verizon Center, increasing the utility and efficiency of the facility and limiting negative traffic impacts on the Georgetown neighborhood. And because many of the event attendees are suburbanites, it does promote re-sampling of the city and captures some spending that wouldn't go to DC otherwise. On the other hand, the area around Gallery Place has been re-positioned not unlike the section of Lake View by Wrigley Stadium, to a district serving visitors, not residents. Washington Nationals Stadium example. Similarly, the Nationals Stadium is not responsible for fostering development in its vicinity, although it does help to brand the district. Development was going on there long before the stadium entered the picture. But like Lake View, the area is developing in ways that are unbalanced (see "Capitol Riverfront: Too much retail for its own good?," Washington Business Journal) and unsustainable, partly because of defects in how the city does planning, but more because of how property is owned and managed by individual property owners seeking value maximization without considering simultaneous actions by competing property owners. It is true that in-city arenas designed to connect to commercial districts have more positive economic impact than arenas and stadiums that are disconnected from their neighborhoods. On this score, both the Verizon Center and the Washington Nationals baseball stadium have more positive impact than the football stadiums serving the Redskins, the old RFK Stadium in DC or the "new" FedEx Stadium in Prince George's County, Maryland. Although again, the impact of the audience and resulting changes in the commercial mix can be significant and somewhat negative for the immediate neighborhood. Buzzard Point and the Soccer Stadium and too much pre-existing development capacity in Southeast and Southwest Washington. Like how the Gallery Place area was going to develop because of the lack of developable property in center and western areas of Downtown, Buzzard Point will redevelop anyway, once the development capacity in that greater area is absorbed. The reason it's empty now isn't because DC economic development policies are sub-optimal, it's because better located properties aren't being developed either, in the face of reduced demand, heightened by a shrinking of federal property leasing activity. Right now the districts on either side of Buzzard Point, the Capitol Riverfront District--where the Nationals Stadium is--and the Southwest Waterfront redevelopment to the west, are still in relatively early phases of redevelopment. As these initiatives move forward, and experience more demand, abutting areas will begin to develop as well. But there is no question that unassisted development is years away, based on the progress in the abutting areas. Both Capitol Riverfront and the Southwest Waterfront have and are experiencing difficulties in terms of leasing space ("Though Developers Built It, The Tenants Did Not Come," Washington Post), losing potential tenants ("Big legal win for developers of the Wharf on the Southwest Waterfront," Washington Business Journal), and having to change the development mix as a result of market conditions and soft demand for certain types of commercial space ("Switcheroo: Once mostly office, Cohen Cos. now proposes residential space for Anacostia waterfront site," Washington Business Journal). Adding more development to that area right now will create problems for the two already soft real estate markets that bracket Buzzard Point. And given that the city has to make choices about where to focus its resources--be it tax incentives, property trades, bond financing, etc.--the soccer stadium should probably be a lower priority than other projects. To sway the council and the public, the mayor’s office and United will need to do a better job selling the project not as a soccer stadium but as a multi-use venue. Which it would be. New MLS stadiums are always labeled “soccer specific,” but there is confusion about that term. “Soccer specific” means they are built for soccer’s needs (seating capacity, sight lines, field width); it doesn’t mean soccer only. The Buzzard Point project would host concerts, college and high school football and lacrosse, as well as college soccer and international soccer. There has also been a suggestion of attaching the National Soccer Hall of Fame — currently without a home — on the property as a year-round attraction. Buzzard Point would host the widest array of acts in the metro area, easily surpassing Verizon Center, Nationals Park, Comcast Center and FedEx Field. Okay, maybe not the 9:30 Club. And United would pay for every last cent of facility costs. What it seeks is assistance in locking down privately held property on the stadium footprint, as well as tax benefits. Is compromise in order? It will have to be. Will Thohir have to pledge more of his family fortune to the plan? Perhaps. Beyond that, as the poll results reveal, Gray and United will need to tweak their tactics, educate, and emphasize the benefits of a gleaming facility in a forgotten part of town. For what it's worth, Comcast Center, the basketball arena for the University of Maryland isn't the right comparison. In a college town located far away from the big city, yes these places get concerts and other events. But when competing against professionally run arenas in big city markets, not typically. The likelihood of there being more events at a soccer stadium than Verizon Center--which hosts four sports teams, the Wizards NBA team, the Mystics WNBA team, the Washington Capitals NHL team, the Georgetown Hoyas college basketball team, and many concerts--is remote, especially because as an indoor arena, it can host events during inclement weather, especially the winter, which an open-air soccer stadium cannot do. Even though the DC baseball stadium doesn't hold many other non-baseball events, it does host 81 baseball games at a minimum. But yes, FedEx Field in Landover isn't used much, for 11 football games including the exhibition and for a few other events as well. Again, it's about what should the city be spending money on--what are the priorities and opportunity costs--and does it make sense to add development capacity to a part of the city that is experiencing soft development, and where abutting areas have already receiving hundreds of millions of public investment and that investment needs to be protected? The other option - granted not on the table - is for a city to take a equity stake in a team and share in increasd financial viability that a stadium can bring. soccer is slighly different in that the TV rights are probably less valuable the the ticket right (at least compared to holy trinity) and you can tax tickets. Can't tax TV revenue. Yes. Except that the teams/leagues won't allow it. E.g., the exception for Green Bay Packers, a fan-owned team. But I agree. As we discussed in another entry on this, there needs to be a way to give localities a virtual percentage of the team/value of the stadium based on what they provide, which monetizes when the team is sold. ... basically just a profit participation tranche, no involvement in management etc. Hi I am Simpi Singh. I have my own boutique chain in delhi and noida. So I need a office space in noida for dealhing and client meeting purpose. I search many office space, but I couldn’t find best one which is suitable for my business. Then I contact Your Office Space and he provide me a best and suitable Serviced Office Space in Noida.